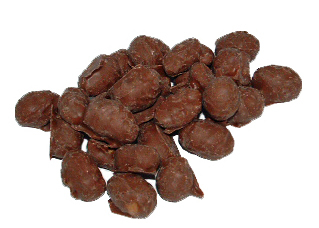 Peanut Butter Peanuts - 1/2 lb. A peanut lover's dream, these large peanuts are coated in a layer of creamy peanut butter then dipped in silky milk chocolate. Smooth and crunchy, sweet and salty, an absolutely perfect combo! Approximately 56 per half pound package.